?Pes Planus? is the medical term for flat feet. It comes from Latin: Pes = foot and Planus = plain, level ground. Very few people suffer from this condition, as a true flat foot is very rare. Less than 5% of the population has flat feet. The majority of the Australian population, however, has fallen arches (an estimated 60-70% of the population) known in the medical profession as ?excess pronation? or over-pronation. Over-pronation means the foot and ankle tend to roll inwards and the arch collapses with weight-bearing. This is a quite a destructive position for the foot to function in and may cause a wide variety of foot, leg and lower back conditions. There are several factors that can contribute to the development of fallen arches. These factors include the following. Genetic abnormality, torn or stretched tendons, amage to the posterior tibial tendon, bone fractures, dislocation of bones, nerve damage, rheumatoid arthritis and other medical conditions. In addition, there are other factors that can increase your risk of developing fallen arches. These risk factors include diabetes, pregnancy, Obesity and Aging. Fallen arches may induce pain in the heel, the inside of the arch, the ankle, and may even extend up the body into the leg (shin splints), knee, lower back and hip. You may also experience inflammation (swelling, redness, heat and pain) along the inside of the ankle (along the posterior tibial tendon). Additionally, you may notice some changes in the way your foot looks. Your ankle may begin to turn inward (pronate), causing the bottom of your heel to tilt outward. Other secondary symptoms may also show up as the condition progresses, such as hammertoes or bunions. You may also want to check your footprint after you step out of the shower. (It helps if you pretend you?re in a mystery novel, and you?re leaving wet, footprinty clues that will help crack the case.) Normally, you can see a clear imprint of the front of your foot (the ball and the toes) the heel, and the outside edge of your foot. There should be a gap (i.e. no footprinting) along the inside where your arches are. If your foot is flat, it?ll probably leave an imprint of the full bottom of your foot-no gap to be had. Your shoes may also be affected: because the ankle tilts somewhat with this condition, the heel of your shoes may become more worn on one side than another. People who have flat feet without signs or symptoms that bother them do not generally have to see a doctor or podiatrist about them. However, if any of the following occur, you should see your GP or a podiatrist. The fallen arches (flat feet) have developed recently. You experience pain in your feet, ankles or lower limbs. Your unpleasant symptoms do not improve with supportive, well-fitted shoes. Either or both feet are becoming flatter. Your feet feel rigid (stiff). Your feet feel heavy and unwieldy. Most qualified health care professionals can diagnose flat feet just by watching the patient stand, walk and examining his/her feet. A doctor will also look at the patient's medical history. The feet will be observed from the front and back. The patient may be asked to stand on tip-toe while the doctor examines the shape and functioning of each foot. In some cases the physician may order an X-ray, CT (computed tomography) scan, or MRI (magnetic resonance imaging) scan. The typical treatment for pain from fallen arches is an arch insert. While many people experience dramatic pain relief from this, others continue to suffer from chronic achy feet despite the arch support. The problem with this approach is that it does not do anything to strengthen the weak ligaments that may be at the root of the problem and, thus, does not alleviate the chronic pain that people with this condition experience. Another standard practice of modern medicine is to use steroids or to prescribe anti-inflammatory medications. However, in the long run, these treatments do more damage than good. Cortisone shots and anti-inflammatory drugs have been shown to produce short-term pain benefit, but both result in long-term loss of function and even more chronic pain by actually inhibiting the healing process of soft tissues and accelerating cartilage degeneration. Plus, long-term use of these drugs can lead to other sources of chronic pain, allergies and leaky gut syndrome. Procedures may include the following. Fusing foot or ankle bones together (arthrodesis). Removing bones or bony growths, also called spurs (excision). Cutting or changing the shape of the bone (osteotomy). Cleaning the tendons' protective coverings (synovectomy). Adding tendon from other parts of your body to tendons in your foot to help balance the "pull" of the tendons and form an arch (tendon transfer). Grafting bone to your foot to make the arch rise more naturally (lateral column lengthening). Leg length discrepancy is a condition where the length of one leg is different than the other (shorter or longer) because of either or both a functional (muscle/posture) or structural (bone/cartilage) abnormality. In the specific a functional leg length occurs when your legs are the same, but another condition such as pelvic tilt or piriformis shortening creates the appearance of one leg being longer or shorter than the other. A structural leg length inequality it means that there is a true difference. Osteopaths, chiropractors and physiotherapist should be able to determine the degree of leg length inequality using visual inspection and manual tests. Some causes of leg length discrepancy (other than anatomical). Dysfunction of the hip joint itself leading to compensatory alterations by the joint and muscles that impact on the joint. Muscle mass itself, i.e., the vastus lateralis muscle, pushes the iliotibial band laterally, causing femoral compensations to maintain a line of progression during the gait cycle. This is often misdiagnosed as I-T band syndrome and subsequently treated incorrectly. The internal rotators of the lower limb are being chronically short or in a state of contracture. According to Cunningham's Manual of Practical Anatomy these are muscles whose insertion is lateral to the long axis of the femur. The external rotators of the hip joint are evidenced in the hip rotation test. The iliosacral joint displays joint fixations on the superior or inferior transverse, or the sagittal axes. This may result from many causes including joint, muscle, osseous or compensatory considerations. Short hamstring muscles, i.e., the long head of the biceps femoris muscle. In the closed kinetic chain an inability of the fibula to drop inferior will result in sacrotuberous ligament loading failure. The sacroiliac joint dysfunctions along its right or left oblique axis. Failure or incorrect loading of the Back Force Transmission System (the longitudinal-muscle-tendon-fascia sling and the oblique dorsal muscle-fascia-tendon sling). See the proceedings of the first and second Interdisciplinary World Congress on Low Back Pain. Sacral dysfunction (nutation or counternutation) on the respiratory axis. When we consider the above mentioned, and other causes, it should be obvious that unless we look at all of the causes of leg length discrepancy/asymmetry then we will most assuredly reach a diagnosis based on historical dogma or ritual rather than applying the rules of current differential diagnosis. As patients develop LLD, they will naturally and even unknowingly attempt to compensate for the difference between their two legs by either bending the longer leg excessively or standing on the toes of the short leg. When walking, they are forced to step down on one side and thrust upwards on the other side, which leads to a gait pattern with an abnormal up and down motion. For many patients, especially adolescents, the appearance of their gait may be more personally troublesome than any symptoms that arise or any true functional deficiency. Over time, standing on one's toes can create a contracture at the ankle, in which the calf muscle becomes abnormally contracted, a condition that can help an LLD patient with walking, but may later require surgical repair. If substantial enough, LLD left untreated can contribute to other serious orthopaedic problems, such as degenerative arthritis, scoliosis, or lower back pain. However, with proper treatment, children with leg length discrepancy generally do quite well, without lingering functional or cosmetic deficiencies. The object of treatment for leg length discrepancy is to level the pelvis and equalize the length of the two limbs. Inequalities of 2-2.5 centimeters can be handled with the following. Heel lifts/ adjustable heel lifts can be used inside a shoe where shoes have a full heel counter. Heel lifts may be added to the heel on the outside of the shoe along with an internal heel lift. Full platforms along the forefoot and rearfoot area of a shoe can be added. There are many different adjustable heel lifts available on the market. For treatment of a leg length discrepancy, consult your physician. They may refer you to a Physiotherapist or Chiropractor for determination of the type of LLD. A Certified Pedorthist (Canada) will treat a structural leg length discrepancy with a heel lift or in larger discrepancies a footwear modification. Heel pain is a common foot condition. It's usually felt as an intense pain when using the affected heel. Heel pain usually builds up gradually and gets worse over time. The pain is often severe and occurs when you place weight on the heel. In most cases, only one heel is affected, although estimates suggest that around a third of people have pain in both heels. The pain is usually worse first thing in the morning, or when you first take a step after a period of inactivity. Walking usually improves the pain, but it often gets worse again after walking or standing for a long time. Some people may limp or develop an abnormal walking style as they try to avoid placing weight on the affected heel. Here are a few in-depth explanations of heel pain causes and potential remedies for those that are afflicted Plantar Fascitis, One of the most well-known causes of heel pain, plantar fascitis occurs when the thick tissue along the arch of the foot becomes tight and inflamed. The foot itself can feel cramped when this tissue is inflamed, causing the afflicted person to feel as if they have a muscle cramp that flexing the foot doesn?t seem to alleviate. Plantar fascitis is most common among men over the age of 40. Warning Signs, The first steps in the morning are extremely painful. Pain flares up after activities like stair or steep hill climbing. Pain continues to occur regardless of the type of shoes or lack of shoes worn. Symptoms of plantar fasciitis vary, but the classic symptom is pain after rest--when you first get out of bed in the morning, or when you get up after sitting down for a while during the day. The pain usually diminishes after a few minutes of walking, sometimes even disappearing, but the pain is commonly felt again the longer you're on the foot. Fasciitis can be aggravated by shoes that lack appropriate support, especially in the arch area, and by the chronic irritation of long-periods of standing, especially on concrete, by being overweight. It doesn't help that fascia doesn't heal particularly quickly because it has relatively poor circulation (which is why it's white in colour). Initial treatment consists of rest, use of heel cushions to elevate the heel (and take tension off the Achilles), stretching and applying ice to the area. You can ice and stretch the area simultaneously by filling a bucket with ice and cold water and placing the foot flexed with the toes upward so that the Achilles tendon region is bathed in the cold water for 10 to 15 minutes twice a day. The Achilles region can also become inflamed around the tendon, called paratendinosis. This condition can be treated with the ice bucket stretching, rest and physical therapy. Another area that is commonly subjected to problems is the attachment of the Achilles near or on the heel bone. The heel (calcaneus) itself can have an irregular shape to it, causing irritation to the Achilles as it twists over the region and inflames the bursa, a naturally occurring cushion. Shoes can often aggravate this condition. Sometimes over-stretching, such as the Achilles stretch with the knee bent, can irritate the tendon and cause a bursitis. Prescription foot orthoses can help reduce the torque of the Achilles tendon in these types of cases. Often, the Achilles tendon calcifies near its attachment due to constant torque and tension. Repetitive stress can cause this calcific spur to crack, creating a chronic inflammatory situation that can require surgery. All of these types of chronic Achilles tendinosis that require surgery are successfully treated in over 90 percent of the cases. As with most foot surgery, complete recovery can take up to a year. Though heel pain is common and can be chronic, it does not have to be your weakness (as was the case with the warrior Achilles from Greek mythology). Some say that this condition should not be called Morton's neuroma as, in fact, it is not actually a neuroma. A neuroma is a non-cancerous (benign) tumour that grows from the fibrous coverings of a nerve. There is no tumour formation in Morton's neuroma. The anatomy of the bones of the foot is also thought to contribute to the development of Morton's neuroma. 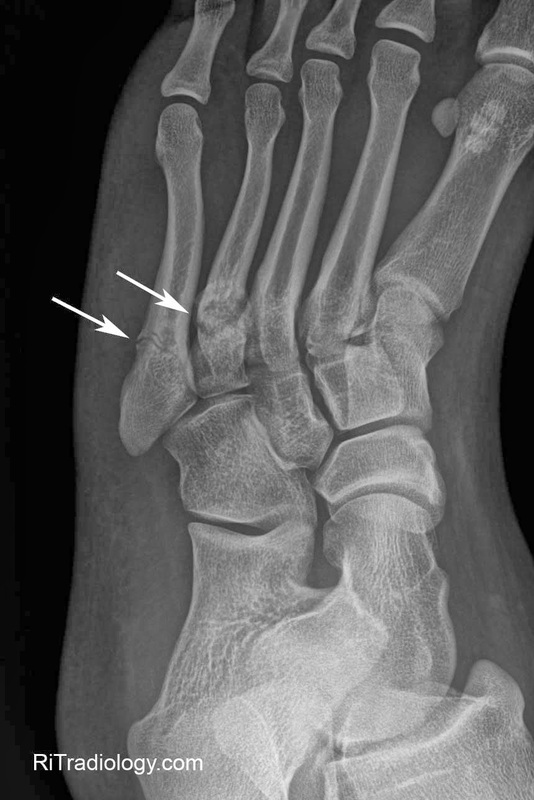 For example, the space between the long bones (metatarsals) in the foot is narrower between the second and third, and between the third and fourth metatarsals. This means that the nerves that run between these metatarsals are more likely to be compressed and irritated. Wearing narrow shoes can make this compression worse. Episodes of pain are intermittent. Patients may experience 2 attacks in a week and then none for a year. Recurrences are variable and tend to become more frequent. Between attacks, no symptoms or physical signs occur. Two neuromas coexist on the same foot about 2-3% of the time. Other diagnoses should be considered when 2 or more areas of tenderness are present. A GP (general practitioner, primary care physician) or a podiatrist (foot specialist doctor) will ask the patient to describe the pain as well as its intensity, when symptoms started, what types of shoes are worn, as well as some questions about their job, lifestyle and hobbies. The doctor will then examine the foot and try to locate the affected nerve. This may involve attempting to reproduce symptoms by manipulating the foot. In order to get a detailed image of the inside of the food, one of the following scans may be ordered. X-ray, this is a type of high-energy radiation. In low doses they are used to diagnose diseases and condition by making pictures of the inside of the body. In higher doses they are used to treat cancer. This procedure is non-invasive and painless. Ultrasound scan, high frequency sound waves are pointed at a specific part of the body, which in this case is the foot. The ultrasound waves bounce of tissues; their echoes are then converted into a picture, called a sonogram. This allows the doctor to get an inside view of the foot. This procedure is non-invasive and painless. MRI (magnetic resonance imagining) a device that uses a magnetic field and radio waves to create detailed images of the body. Unlike CT scanning or general x-ray studies, no ionizing radiation is involved with an MRI. This procedure is non-invasive and painless. The doctor will have to rule out other conditions which may have similar symptoms, including capsulitis, bursitis, or Freiberg's disease. Treatment strategies for Morton's neuroma range from conservative to surgical management. The conservative approach to treating Morton's neuroma may benefit from the involvement of a physical therapist. The physical therapist can assist the physician in decisions regarding the modification of footwear, which is the first treatment step. Recommend soft-soled shoes with a wide toe box and low heel (eg, an athletic shoe). High-heeled, narrow, nonpadded shoes should not be worn, because they aggravate the condition. The next step in conservative management is to alter alignment of the metatarsal heads. One recommended action is to elevate the metatarsal head medial and adjacent to the neuroma, thereby preventing compression and irritation of the digital nerve. A plantar pad is used most often for elevation. Have the patient insert a felt or gel pad into the shoe to achieve the desired elevation of the above metatarsal head. Other possible physical therapy treatment ideas for patients with Morton's neuroma include cryotherapy, ultrasonography, deep tissue massage, and stretching exercises. Ice is beneficial to decrease the associated inflammation. Phonophoresis also can be used, rather than just ultrasonography, to further decrease pain and inflammation. A Hammer toes is a toe that tends to remain bent at the middle joint in a claw-like position. There are 2 types of hammer toe. Flexible hammer toe, can be straightened by hand. Rigid hammer toe, cannot be pulled straight and can be extremely painful. The position of the toe can also lead to corns or calluses. These may also be painful. Hammer toe may be present at birth or develop later in life due to tendons that have tightened, causing the toe's joints to curl downward. Occasionally, all toes may be bent. This may be due to problems with the peripheral nerves or the spinal cord. Conservative treatment starts with new shoes that have soft, roomy toe boxes. Shoes should be one-half inch longer than your longest toe. (Note: For many people, the second toe is longer than the big toe.) Avoid wearing tight, narrow, high-heeled shoes. You may also be able to find a shoe with a deep toe box that accommodates the hammer toe. Or, a shoe specialist (Pedorthist) may be able to stretch the toe box so that it bulges out around the toe. Sandals may help, as long as they do not pinch or rub other areas of the foot. Hammer toes is a painful deformity wherein a toe bends unnaturally and becomes clawlike. This happens because the tendons of the toe contract abnormally, forcing the toe to bend downward and the middle joint of the toe to protrude upward. Although any toe may be affected, hammertoe usually affects the second toe. The toe assumes a clawlike position and cannot be straightened out. When someone with hammertoe wears shoes, the toe is constantly rubbed, so walking may become especially painful if a callus on the sole of the foot or a corn on the top of a toe develops. The APMA says that hammertoe can result from a muscle imbalance in the foot that puts undue pressure on the joints, ultimately causing deformity. Inherited factors can contribute to the likelihood of developing hammertoe. Arthritis, stroke or nerve damage from diabetes or toe injuries such as jamming or breaking a toe can affect muscle balance in the foot, leading to hammertoe. The Mayo Clinic says that wearing improper shoes often causes hammertoe. Shoes that squeeze the toes, such as those with a tight toe box or with heels higher than two inches, can put too much pressure on the toe joints. Surgery to correct for a hammertoe may be performed as a day procedure. There are several different types of procedures that can be used depending on hammertoes the foot structure and if the deformity is flexible or rigid. You can avoid many foot, heel and ankle problems with shoes that fit properly. See your doctor if you have foot pain that's persistent and that affects your ability to walk properly and carry out other motions with your foot. Also, see your doctor if one or more of your toes has developed a clenched or claw-like appearance. A bunion is an unnatural, bony hump that forms at the base of the big toe where it attaches to the foot. Often, the big toe deviates toward the other toes. When this occurs, the base of the big toe pushes outward on the first metatarsal bone, which is the bone directly behind the big toe, forming a bunion. If this happens on the little toe and fifth metatarsal, it's called a bunionette. Because a bunion occurs at a joint, where the toe bends in normal walking, your entire body weight rests on the bunion at each step. Bunions can be extremely painful. They're also vulnerable to excess pressure and friction from shoes and can lead to the development of calluses. With prolonged wearing of constraining footwear your toes will adapt to the new position and lead to the deformity we know as a foot bunion. Footwear is not the only cause of a bunion. 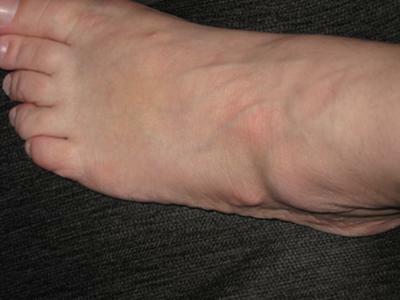 Injuries to the foot can also be a factor in developing a bunion. Poor foot arch control leading to flat feet or foot overpronation does make you biomechanically susceptible to foot bunions. A family history of bunions also increases your likelihood of developing bunions. Many people who have a bunion have a combination of factors that makes them susceptible to having this condition. For example, if you are a women over the age of forty with a family history of bunions, and often wear high-heeled shoes, you would be considered highly likely to develop a bunion. Bunion surgery can be performed under local or general anaesthetic. The operation usually takes between half an hour to an hour. There are several types of bunionectomies. Some involve removal and realignment of the bones in your foot. Mild bunion problems can sometimes be resolved using soft tissue release or tightening. For some very severe cases bones of the big toe are fused or the bunion is cut out along with some of the bone at the base of the toe. Be sure and discuss which type of operation you will have with your surgeon. With any type of bunionectomy your surgeon will make one or more incisions (cuts) near your big toe. They will use instruments to trim the bones and remove the bunion. Wire, screws or plates may also be used to hold the new joint in place. The best way to reduce your chances of developing bunions is to wear shoes that fit properly. Shoes that are too tight or have high heels can force your toes together. Bunions are rare in populations that don?t wear shoes. Make sure your shoes are the correct size and that there's enough room to move your toes freely. It's best to avoid wearing shoes with high heels or pointy toes.